If you want to avoid sliding around on the oil-covered floor while you put in work on vehicles, you’ll need to invest in a great mechanic’s creeper. Mechanic creepers are made in all shapes and sizes, however. How are you supposed to know which is the most comfortable and most useful? In this article, we’ll check out a handful of the best mechanic’s creepers on the market so that you will know which creepers are quality additions to your hardware collection and which will leave you with an aching back. What Should You Look For In A Mechanic’s Creeper? How Long Should My Mechanic’s Creeper Last? What If I Am Very Tall Or Wide? How High Does My Mechanic’s Creeper Need To Be? 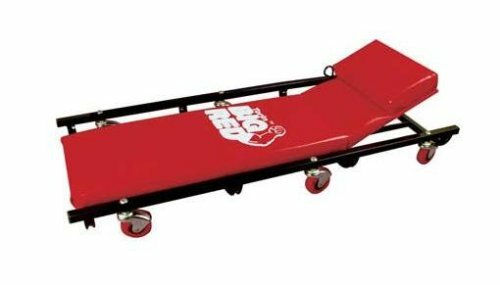 The Pro-Lift C-4031 Red ‘The Bone-ster’ Mechanics Garage Creeper is a minimalistic yet surprisingly comfortable creeper which scoots a mere 1-1/4th inch off of the ground. The dog-bone shape of the Pro-Lift mechanic’s creeper might seem uncomfortable at first glance. There’s more to this creeper than meets the eye, however. The middle part of the creeper is slightly dimpled downward to accommodate your spine and back. You will appreciate the grooves in the creeper’s center, too. These grooves help you to distribute your weight comfortably while also helping you to stay cool during serious exertion. Likewise, the four edges of the creeper stay out of the way of your legs and arms to give you an unrestricted field of movement. 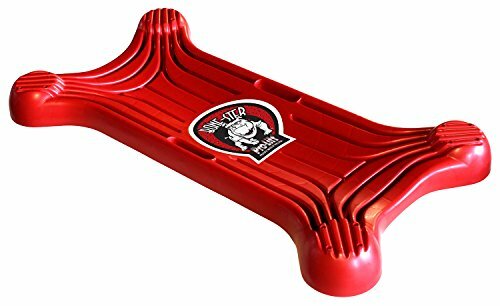 Luckily, the Bone-ster can bear up to 400 lbs of weight, and these comfort features behave the same no matter your body’s dimensions. The creeper itself is made from an easy-to-clean polymer, so you won’t need to worry about getting grease or oil all over it. As far as creepers go, this unit is very durable owing to its one-piece design. The wheels won’t be popping off anytime soon. 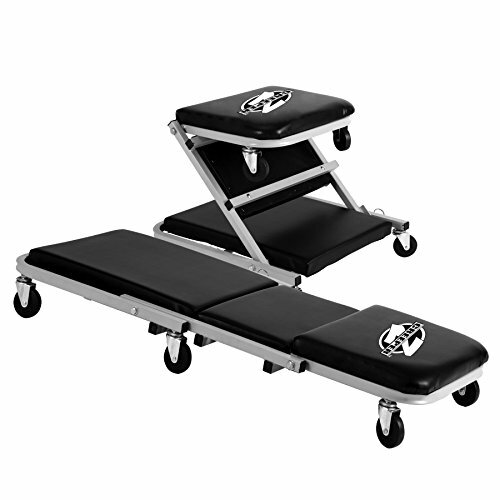 The Pro-Lift C-2036D Grey 36″ Z-Creeper Seat is a combination mechanic’s creeper and mechanic’s seat with some serious cushioning. The C-2036D is great because it can function as either a seat or as a creeper. Transitioning between the two modes is relatively easy, and you’ll appreciate the ability to sit up from time to time. As far as the creeper functionality of the unit goes, the C-2036D fares well. The cushions are indeed very plush. However, wider users may find it annoying how narrow the sides of the unit are. The head and neck support of this creeper is deceptive because the cushion appears to be very large. Nonetheless, the awkward incline from the bed of the creeper to the headrest can make it fairly uncomfortable for many people. Furthermore, this creeper doesn’t rate very well as far as durability is concerned. While the plushness of the cushions makes staying at work for long periods of time very easy, the cushions themselves are easy to stain with oil or grease. Once the stain is established, it’ll be practically impossible to remove. This isn’t a deal breaker, but the cushions are also subject to puncture or ripping under certain conditions. You should treat this creeper carefully if you want it to last. Finally, this creeper is fairly high off of the ground. While this won’t be a problem for most situations, you will need to jack each vehicle up a bit higher than otherwise. 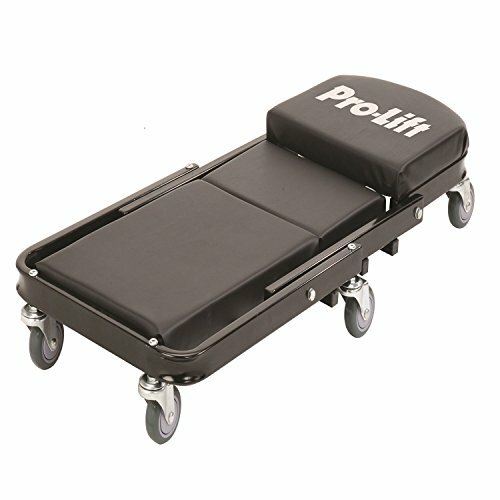 The Pro-Lift C-9100 Black 40″ Foldable Z Creeper is another transformable mechanic creeper from Pro-Lift. Unlike the other Pro-Lift model, this creeper is even easier to transform between creeper and seat modes and can carry up to 450 lbs. This mechanic’s creeper stacks up more favorably than its sibling creeper which we just reviewed. Unlike the other Pro-Lift creeper, the cushioning on this creeper is chemical resistant and is comfortable for individuals of all proportions. The creeper is over a foot wide, which makes it more comfortable for most users. While this creeper does ride high off the ground, the cushions are recessed into the body which holds the castors, so its effective height is fairly low. The castors are effective at moving the creeper around smoothly despite not being made of heavy duty material. While there aren’t any external handles to make moving the creeper around any easier, there are a couple of easy places to grab near the bottom. This creeper is a bit heavy thanks to its extensive cushioning. If you’re larger than most people the extra weight will be worth the added comfort, however. The Torin Big Red Rolling Garage/Shop Creeper: 40″ Padded Mechanic Cart with Adjustable Headrest is a massive mechanic’s creeper which is fairly comfortable for everyone at the expense of being difficult to move around and an eyesore. The Torin Big Red mechanic’s creeper takes the concept of a mechanic’s creeper to the limit. This creeper is practically a gurney for people who want to do work on their vehicles. It’s well-padded, and the adjustable headrest means that it should be easy to find a comfortable working position for your head and neck without much effort. The padding for the back and shoulders is also extensive. In particular, the shoulder padding is built to accommodate the fact that you may sometimes be bearing the weight of your body on your shoulders while lying down and working on something tough. This feature makes it feel a bit awkward at first, but you’ll appreciate the added padding while you’re hard at work. The drawbacks of this creeper are that it’s massive. There are handles which you can use to move the creeper around, but it’s still heavy and it still takes up a lot of space. Furthermore, the bright red color of the cushioning is difficult to look at. It will also discolor when exposed to grease, and some individuals may find the plastic feel of the cushioning to be undesirable. 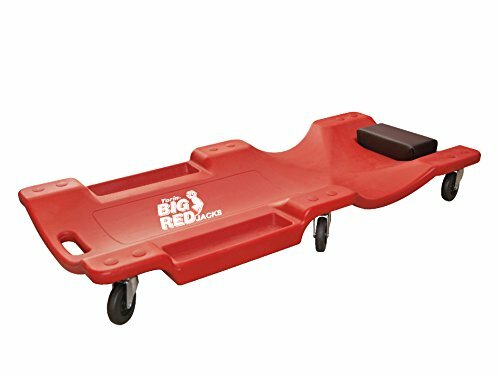 The Torin Big Red Rolling Garage/Shop Creeper: 40″ Plastic Mechanic Cart with Padded Headrest is an oddly shaped creeper which relies on good ergonomics rather than extensive cushioning to make for a comfortable experience. Unlike its peers, this Torin mechanic’s creeper only has a sparse single block of cushioning for your head. There isn’t any ability to adjust this headrest, which means that some users may find it to be very uncomfortable. The same goes for the plastic bed of the unit. While it is easy to clean, it isn’t very resistant to physical trauma, nor is it very comfortable for most users. There aren’t any heat-reducing measures either, so you may find yourself getting sweaty while you work. This unit’s strong points are that it is fairly lightweight. It also has a small bucket for storing tools on the side, which would be nice if it wasn’t out of reach when using the creeper as intended. The main features that you should be looking for in a mechanic’s creeper are comfort, ease of cleaning, and ease of use. Comfort is by far the largest concern. Not all mechanic’s creepers will be comfortable for all people. Especially if you are very wide or very tall, finding a comfortable creeper will be more of an effort than it might be otherwise. More padding doesn’t always equal more comfort. Sometimes padding gets hot and sticky or merely heavily stained by oil. Likewise, some forms of padding are outright uncomfortable. Find what works for you. The biggest section where you need padding is in the headrest. Your head is very heavy, and it will quickly become a source of pain in creepers which don’t attend for its position and weight. Likewise, your neck needs to be kept stabilized by the creeper. You also need sufficient mobility of your head and neck while you are working. The creepers with adjustable headrests are usually the ones which guarantee the least neck and head strain. Easy cleaning is a critical feature of mechanic’s creepers because your creeper is going to get dirty. The car shop is a place with a lot of environmental hazards and opportunities to get dirty. If your creeper isn’t easy to clean, it’ll accumulate the grime. Once the grime is established in your creeper’s padding, it’ll be impossible to get out. Make sure that the creeper is stain resistant. Most mechanic’s creepers can be cleaned with soap and water, although some require special treatment owing to their cushions. Ideally, your mechanic’s creepers should be simple to clean with soap and water — if there are a lot of grooves in the bed of the creeper to help with dissipating excess heat from your back, it can be hard to give the entire unit a deep clean. You will probably be fine if you restrict your cleaning to the easy-to-access surfaces, however. Finally, ease of use is important in creepers. This means that the best creepers have added handles and places to store your equipment while you are working. You will probably want to replace your mechanic’s creeper every five years or so. Even the best-kept creepers get dirty and broken down on this timescale, especially if they have seen heavy use. The more broken down your creeper is, the less comfortable it will be to use. Many creepers will also develop problems with their castors long before their cushioning starts to degrade, however. The creepers made without any padding will typically last significantly longer, but they also tend to be less comfortable. For these units, the castors are the part which fails first. You can often repair the castors if you are determined enough, however. Mechanic’s creepers without any cushioning can last as long as ten years or more if you take care of them effectively. In fact, many of them are durable enough to last a long time even without additional cleaning or maintenance so long as the castors hold up. Most mechanic’s creepers are made for people who are of average height and width. For people who are taller, this means that you will be hanging awkwardly off of the bottom of the creeper under normal circumstances. If you have wide shoulders or sides, you will also hang off of the edges of your creeper. This will be very uncomfortable, especially in the long run. Luckily, there are many mechanic’s creepers which are designed for people who are tall or wide. You should opt to find one of these specialized mechanic’s creepers rather than one of the standard sized creepers. The difference in comfort will be worth your while. Most mechanics will agree that mechanic creepers should be as short as possible. The shorter the creeper, the less you will need to jack up the car. You will have more room to work with a shorter creeper. Nonetheless, most creepers scoot anywhere from 1 to 4 inches off of the ground. The castors tend to take up most of the height of the creeper, though in some cases the cushions are extra luxurious. The best rule of thumb is to pick the creeper that is the most comfortable for you at the least possible height. Typically, this means that you will need to eschew bonus features like the ability to transform from a creeper into a stool. These features are useful, but they typically add a significant amount to the creeper’s height and weight without necessarily adding to comfort. The best creepers are minimalistic and thus very compact.